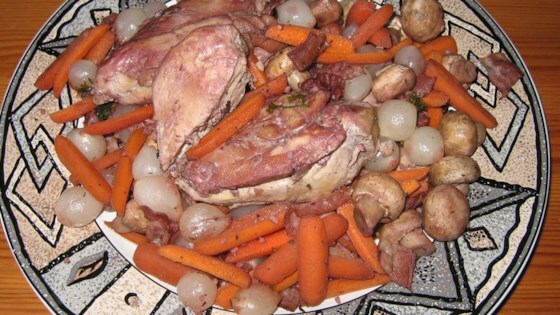 "This is a French chicken dish cooked with vegetables, herbs and burgundy wine that is absolutely marvelous. I make it for special occasions and am always complimented on it. Serve with hot cooked noodles, crusty French bread and a green salad, if desired." Spray a large non-stick skillet with cooking spray. Saute chicken over medium heat for about 15 minutes, or until lightly browned on both sides. Add the mushrooms, carrot, wine, onions, bacon bits, parsley, garlic, marjoram, thyme, bouillon, pepper and bay leaf. Bring to a boil, then reduce heat to low; cover and simmer for 25 minutes, or until chicken is cooked through and no longer pink inside. Using a slotted spoon, transfer chicken, mushrooms, carrot, and onions to a platter, discarding bay leaf; cover to keep warm and set aside. In a small bowl combine flour and water and whisk together. Stir mixture into skillet and cook until thick and bubbly, 5 to 10 minutes. Cook and stir 1 minute more and pour mixture over chicken and veggies. Serve warm. Fabulous flavour and took all of 20 minutes to prepare. Looks impressive and smells divine. Works great with sherry and a bit of worchestershire as well. This dish explodes with marvoulous flavor. We enjoyed it over egg noodles. Thanks for a complete and exciting meal!